You must make reservations at least 5 minutes in advance of the time at Table Rock House Restaurant. Across the street from Table Rock Center, Falls Parking lot provides the easiest access to Table Rock House Restaurant. The Bridge of Flowers connects Falls Parking Lot with the second level of Table Rock where Table Rock House Restaurant is located. Enjoy easy access to the WEGO main transfer hub located at Table Rock Center. Fireworks & Illumination Every summer, Niagara Parks hosts Canada's longest running fireworks series, directly over the Falls! Experience a dazzling display of colour, with absolutely breathtaking vantage points in our Grand Hall. 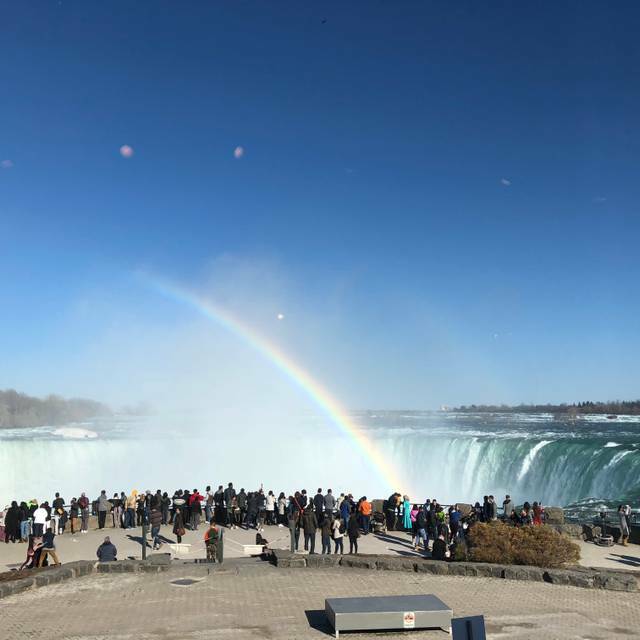 You'll also enjoy the nightly illumination of Niagara Falls, in the brilliant colours of the rainbow from your table at Table Rock House Restaurant. 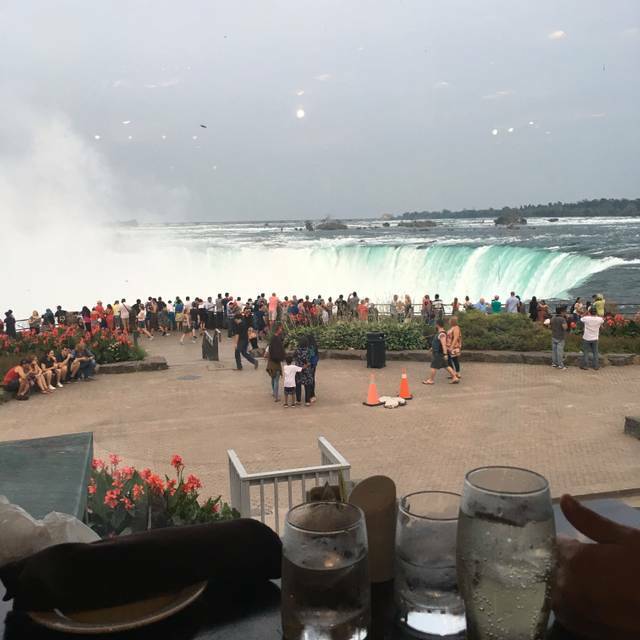 Your table at the newly renovated Table Rock House Restaurant is just steps from the thundering edge of the Horseshoe Falls. It's not a tag line, no one gets you closer to the thundering waters, literally. Whether you're looking for a romantic dinner with the illuminated Falls as your backdrop or just casual drinks, let the stunning view make your dining experience come alive. After dark, the nightly illumination of Niagara Falls transforms your experience into one you'll never forget. At Table Rock House Restaurant, we pride ourselves on not just serving our guests, but serving your senses. Featuring the freshest ingredients from local farms and selection of VQA wines from the vineyards of Niagara, we're proud to be a Feast ON certified dining experience. Seating by the windows is an excellent experience. Food was good. Overall good experience. Went with the family while visiting Canada. It was a pleasant experience, but not something I'd purposely repeat. Great server Rachel and delicious food! Beautiful view and they have local Niagara-on-the-Lake wineries tasting flights! Beautiful view and delicious food- loved the ice wine vinegrette dressing and the steak was perfect! They even have fun wine and beer tasting flights from local wineries/breweries. Perfect meal with a great server named Rachel. Amazing views. Good food. Great value. This is not a fine dining establishment, but it is definitely a great restaurant! The view is the main attraction here. The fish sandwich was amazing, I didn’t eat the bun so it was a gluten free option. The steak was horrible. A great way to take in the view out of the cold. We made a reservation on open table en route from Toronto. I think because of that we were given a prime view table. Elements on the Falls was an excellent choice. 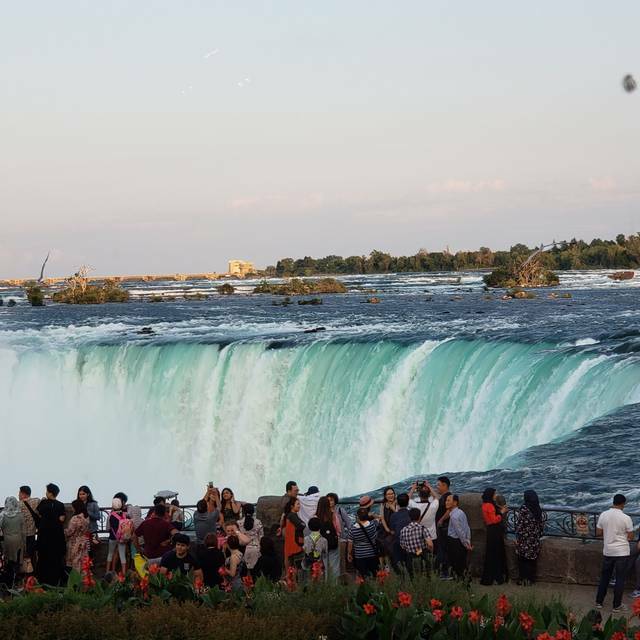 Brilliantly placed right next to the Horseshoe Falls it is the place to be for an unforgettable evening. 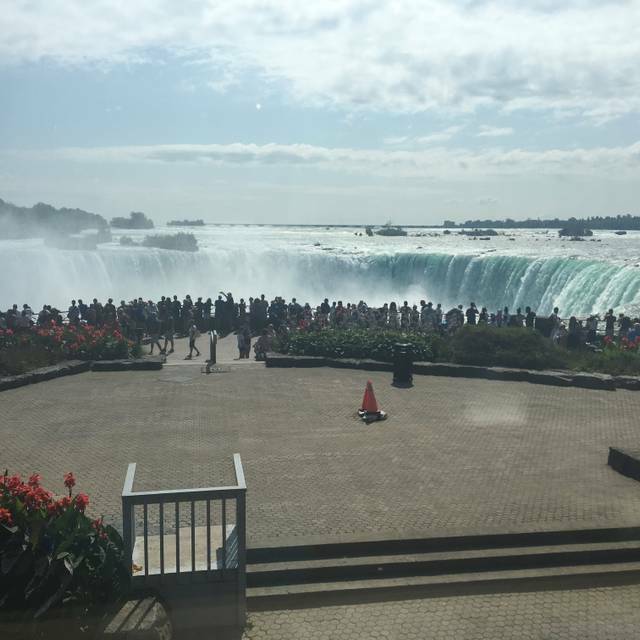 Hands down the best restaurant view of the Falls!!! 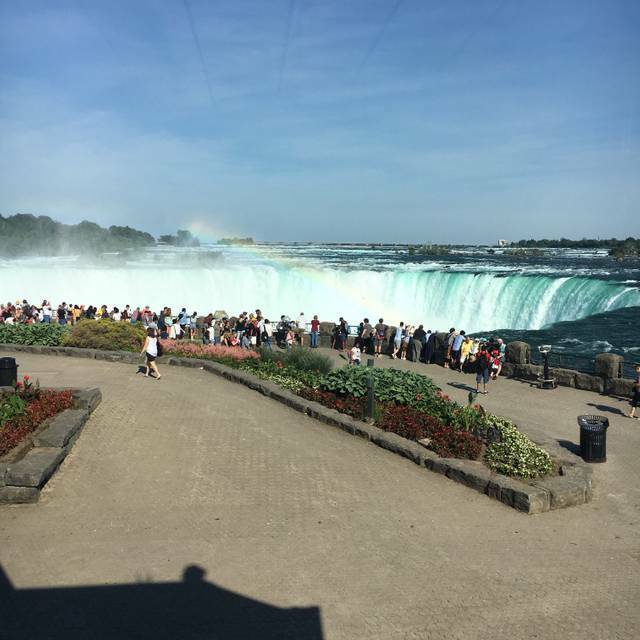 This restaurant has excellent views of Niagara Falls, excellent service and excellent food made with local ingredients at a reasonable price. You can dress casually or dressy here and you won't feel out of place. Great food and location with family and friends. A terrific way to start the holiday season! Lunch was outstanding with local ingredients, including Craft Brews from Silversmith! Tracey our waitress was a gem. She was courteous, quick, and seemed to really love her job. It definitely showed with her service that she provided. She put our dining experience over the top. She offered great suggestions on the menu and even sang Christmas carols at our table! 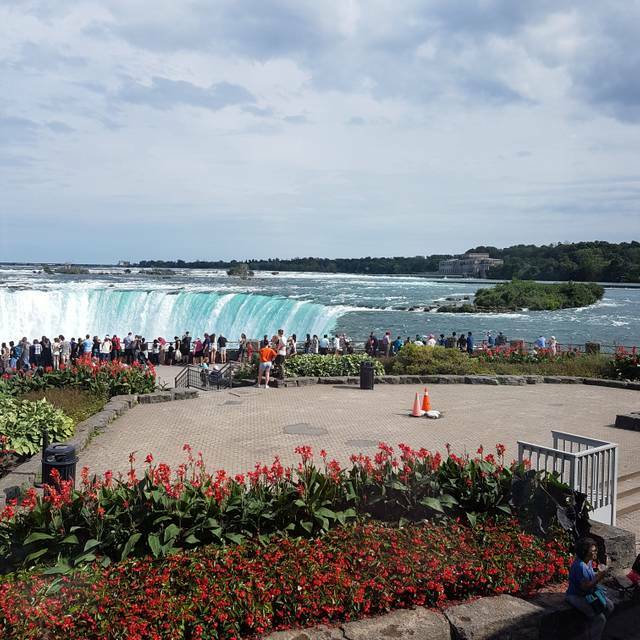 The view is something you simply cannot experience anywhere else or any better in the entire Niagara Region. Dessert. Just. Say. Yes! Amazing view of the falls. Great food and the attendants were great! Staff were friendly, food was excellent & dessert was delicious! Had dinner with Friends. Restaurant was near empty so it was great for conversation. The food was very good and the service was excellent. We did find it a little chilly but other then that it was wonderful. I will definitely return. We had an amazing server Nilsa - she was knowledgeable -attentive and made excellent recommendations - she enhanced our experience! The view is one of the best of the Falls - the food was delicious and the wine fantastic - local products! A real gem! Great view. Food and service were alright. Wine list inadequate. They really should invest in some decent wine glasses. 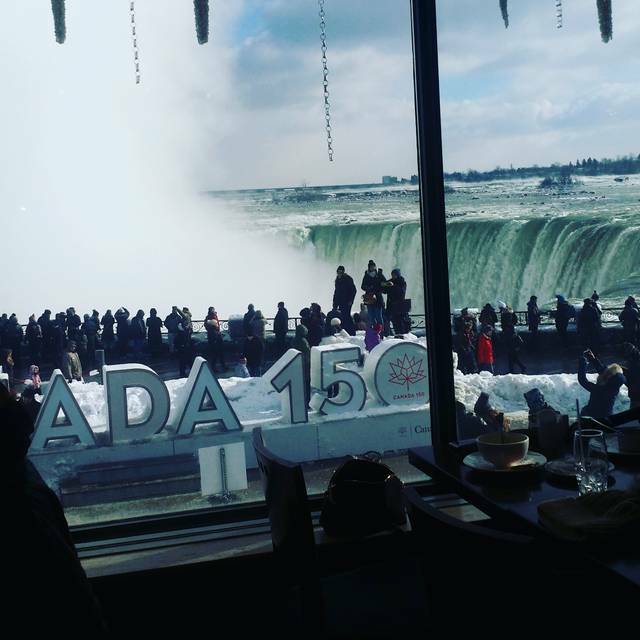 We enjoyed lunch with friends celebrating our friends Birthday great food and a view if the Falls❤❤❤❤🍷🍷🥂 priceless. The view is wonderful. The food was good too. It was easy to make a reservation on line. It was a perfect setting. Can NOT beat the view of the Falls! Spectacular! Every table gets a perfect view. The sightview was great but the sever name Maria? She was really rude because she was talking like she doesn't like us it makes feel me uncomfortable and she didn't give us the seat even we got appointment. I don't want to recommend this place to anyone. You can't beat the view of Niagara Falls! Waitress was friendly and helpful with options so we could order what we wanted for the best price. Pricey, but worth it! The view was great. Service was fairly decent. Food was bland and not worth the money. Vegetables were under cooked. Chicken had little to no flavor. Nor did the vegetables. My friend had the squash ravioli which did not pair well with a red sauce. A cream sauce would have been much better suited for that flavor. Overall, way too much money for the food. Understandably, you come to Elements on the Falls for the view, but our lunch was very good and the service was excellent. Beautiful turkey dinner and venue for Thanksgiving! Awesome spiced pumpkin soup, delicious bread, a generous portion of turkey, stuffing, mashed potatoes, gravy and cranberry sauce. Vegeteble medley was a bit undercooked for my liking, but the pumpkin pie with fresh berries and whipped cream made up for it! All in all a great dining experience. Waitress seemed overwhelmed or irritated, especially when we asked for warm bread instead of the colder than room temp bread she first delivered. After that she seemed to try harder. Not an easy job, but bringing requested lemons for my water after I finished my meal was not helpful. Food was great. Maybe they need additional wait staff. We had dinner and the view of the falls was wonderful. The food was great and the service very good. This turned out to be a great meal! 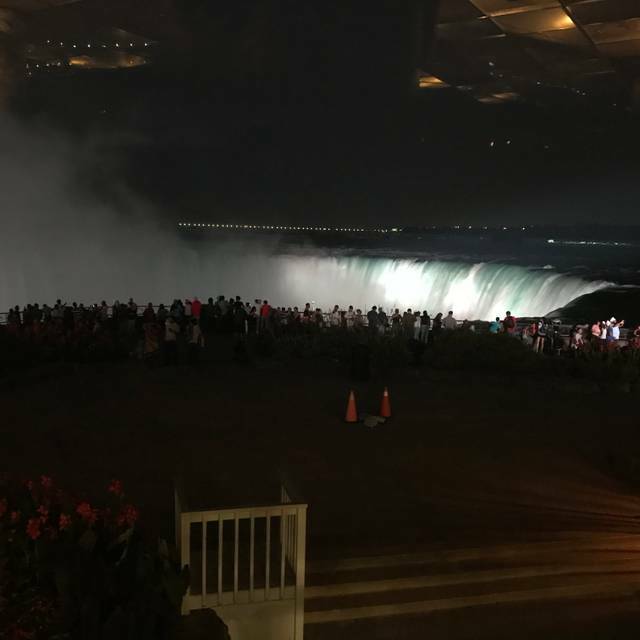 We did the set menu and got some delicious food with some exceptional service... and an EXCEPTIONAL VIEW of the Falls! Le menu n’est pas tellement recherché mais acceptable. La nourriture est correcte sans plus. Le service est toutefois très attentionné, vue imprenable sur les chutes. 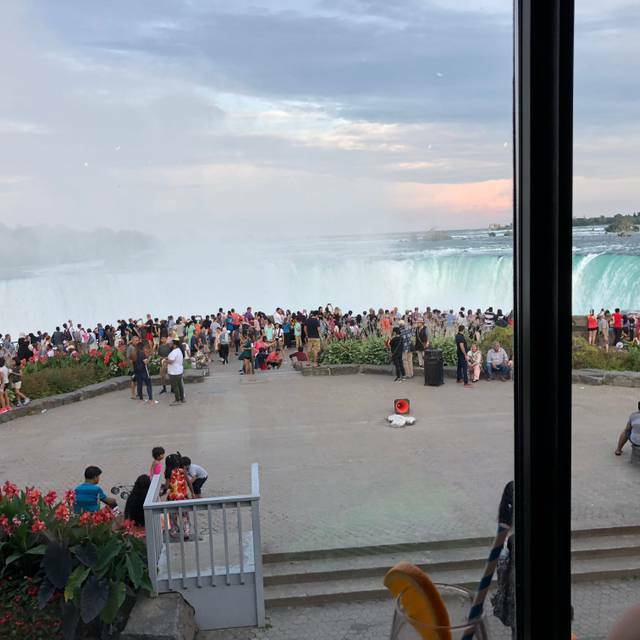 A very nice restaurant with fantastic view of Niagara Falls. Service was excellent. Many well prepared meals and a large selection of wines and specialty mixed drinks. Our server Nitsa was very personable and gave great suggestions. The staff was amazing the view great. But the food, mediocre. The rib eye steak ordered med rare came medium well and honestly not a steak I would serve anyone. It was thin grizzly and unappetizing looking. The food was terrific and the service was nice. The view is fantastic!!! When visiting Niagara Falls this restaurant is a must. The view is amazing. The food was delicious. Great service. We had a reservation and was seated right on time. We went with friends and we were able to leisurely sit and talk while eating and enjoying the view. Our server Andrea was amazing. We had a seat right by the window and she was so sweet and attentive. I would definitely go again! We had a lovely anniversary meal at Elements on the falls, and our view was breathtaking! Sweet staff, good food! Dessert was amazing! Although parking was horrific, so plan to set aside an additional 45 minutes just to park and walk to Table Rock Centre, the complex where Elements is located. A great location with world class views and ambience. Excellent, enjoyed the environment and the service was excellent.